When it was announced that the 2015 Convention was to be held at Te Papa, Wellington, I decided that an appropriate model for this city would be a lift, or elevator. About 35 years ago while on a training course at a technical institute I borrowed a book from its library. 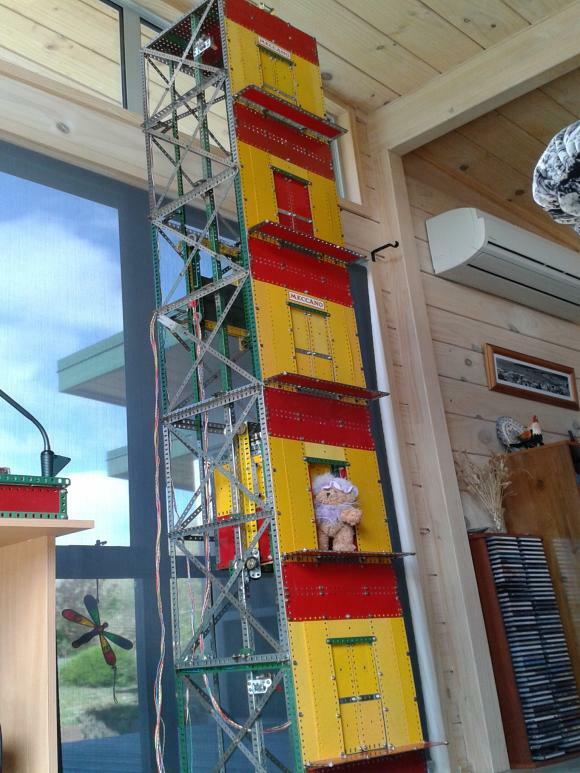 It was about lift construction, and it had enough photos, drawings and a control circuit to get me enthused about reproducing this in Meccano. The time had arrived, so with a bit of research visiting buildings with glass-sided lifts, some hours on YouTube looking through lift service videos, and plenty of trial-and-error construction time later, the model was created. It was a popular exhibit at the Convention, from the youngest button-pushers to technical discussions with at least four people working in the lift industry. Initial research showed that lifts are not a commonly published model. The most well-known examples would be the Eiffel Tower and the Freight Warehouse, both of which simply treat lifts as a box that goes up and down endlessly. I wanted to create something a bit more realistic, with the ability to be sent to floors at random, and with working doors running in the proper sequence. The late Don Blakeborough built one, apparently of three floors and automatic in operation, but this was long before I joined the WMT Meccano Club so I never saw it.